As we drove home last evening from seeing the movie Mamma Mia (YES - I saw it again, this time with my husband, who typically has a disdain for musicals, but this one broke the mold. He loved it!) ... oops, I digressed. A motorcycle passed us. The driver had a passenger: a dog! Have any of you ever seen this? I had not. We drove beside them long enough to check out the situation. The driver had some sort of backpack-contraption for the dog. She was stuffed down into it, so that she rode piggy-back fashion on her master. It looked like there was a chain securing her collar to the top of the backback. She looked marvelously content: front paws sticking out, ears flapping as she looked around. Now, this dog looked amazingly similar to our dog, Ellie. So imagine our sweet Ellie, riding piggyback ..... on Bill, on a motorcyle! Now, that I'd love to see! However, I'm pretty sure I never will. Upper upper. Lower upper. Upper lower. Lower lower. To those familiar with Michigan geography, this won't seem odd. But the TV weather isn't the time to sort out these regions in my mind. All this upper/lower double-talk serves to distract me from the purpose of tuning in to the weather in the first place. I try. I really do. But by the time I've figured out where I am: the upper, the lower, or somewhere in between, it's on to sports. Anyhow, there is a mighty bridge connecting the upper and lower parts of the state, and I crossed it last week. Five miles long! It's massive and has served its purpose regally for 51 years. 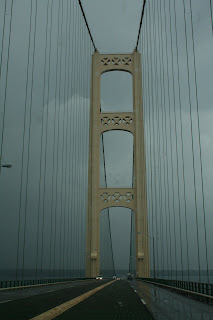 It's called the Mackinac Bridge. Pronounced "Mackin-AW." Another curiosity. I suppose every state has its oddities . . . . such as designating an inedible nut as your state university's mascot. Some things I will never understand. My joke over the years is that my husband would prefer a root canal over picking up a paintbrush. So this week, when we teamed up to paint the "guest house" at our Michigan cabin, I was more than a little surprised. And excited by the results of our day-and-a-half effort. He's a good hubby. Though he really did a LOT more scraping of the old paint than painting the new paint. Which suited me just fine. You might be too young to remember this slogan. But it was a popular bumper sticker in the 70's, when Bill and I first met in Bristol, Virginia. So here we are, empty-nesters and we find ourselves back in Virginia. The drive home from N.C. turned out to be a long day of scenic intentional detours, stops at peach stands and a BBQ lunch to die for at The Galax Smokehouse. Galax, Virginia. Home of the huge fiddlers convention. And of delicious BBQ. The Smokehouse's head cook, Earl, was helping wait tables and proceeded to school us on BBQ (beef brisket or pulled pork) and BBQ sauces. Out came the bottles: the plastic squirt-type: red for hot, yellow for sweet, and the rest opaque, of which "Mountain sauce" was my favorite. We learned that this concoction had been created by Earl himself, with the help of his co-workers. They mixed, tasted and seasoned until it was just right. And just right it is. yummmmmmmm. Now, I know Earl had us pegged as purebred Yankees. However my palate still yearns for the heavenly flavors of true southern BBQ, since after all I was born and weaned on the fabulous BBQ of Memphis, Tennessee. And, my Yankee friends, BBQ does NOT mean "meat with bottled sauce poured over it." As Earl pointed out, "barbecue is a process, not a product." How eloquent. Smoke it slowly, to tasty perfection. Then gently lace it with your sauce of choice. But only after it's on the bun, sitting on your plate. One other thing. Earl's accent. It was as rich as the smoke rising above the restaurant. Though there are as many southern accents as types of BBQ, most any southern drawl comforts and draws me in. It speaks love. And it just feels a little like home. p.s. this post should be dated Friday, August 22. But there we go again: I'm tech-challenged. Some get on with growing up at a tender age. Dan and Jenny, my son and daughter-in-love, are doing a good job of it and they're only 23. Married for just over a year, it's amazing how much they've accomplished. Oh, they're challenged - sure. Being a grown-up involves a lot more than they imagined. Getting married, leaving college life to settle in a new city, working full-time, setting up a household and dividing the work all take energy and grit. 1. they talk over decisions. 2. they joke and laugh together. 3.they're adopting the Dave Ramsey philosophy to "live like no one else" in order to achieve financial peace. 5. they are part of a body of believers and are investing in the spiritual lives of others. 6. they strive to exercise and eat very health-fully. Whoa, Jenny can cook! 7. though Jenny is very strong and capable, she intentionally lets Dan lead. This is a sign of her strength and wisdom. 8. they try to appreciate each other for who they are, not who they wish for. That is, they exercise grace. 9. they seek God's will for their lives. Not every day is a bowl of cherries. Life will deliver challenges. But all in all, these two have a great start. Thanks for the weekend, D & J! p.s. Sorry, readers. I haven't figured out how to: 1. place photos anywhere other than the top of a post or 2. put captions under the photos. I can't explain it, and I'm not sure he can, either. But Bill loves car racing. Sorry, but I don't know the difference between Nascar and sprint cars and dragsters. But Dan and Jenny live just 10 minutes from the LOWES MOTOR SPEEDWAY in Charlotte and this is a very big thing for car racing fans like Bill. Lucky Saturday! The gates to the speedway were open so we strolled on in and took a seat. Wow. The place is gi-normous. I can't begin to guess how many race fans can fit inside. Down by the track was a big sign: "Ride in a car for just $109." Which means you pay to ride along with a driver who zips around the mile-long track. Fast. Too fast for me. I think I'd rather scrapbook than get in one of those cars. But it was pretty neat to see Bill take it all in! So, as we wandered around the Charlotte Convention Center, dodging the scrapbookers, I noticed another gathering was underway. A BOAT SHOW! And what do you know: though we could have paid admission to the show, there was also a large plate-glass window overlooking the showroom, affording a free view to all. So we looked. Many, many boats on display: mostly large and all of them shiny and and beautiful. Obviously, if we weren't willing to pay admission, we sure weren't in the market for a new boat. But it was amazing to see the people who were. Quite a day in downtown Charlotte. Oh, by the way. Katie has arrived safely in Ireland! She called us early this morning. As I write, we are in Charlotte, N.C., visiting Dan & Jenny, our son and daughter-in-law (whoops, I mean daughter-in-love). More on the actual visit in a later post. For now, I relate a curious encounter in downtown Charlotte. Dan, Bill and I had some time to kill while Jenny finished up at her job. She pointed us across the street to the convention center where we observed a variety of people bustling in and out. Many of them carried large tote bags or pulled rolling suitcase-type things behind them. We soon realized....it was a .... SCRAPBOOKING CONVENTION?! For real! Now, I have made my sentiments on scrapbooking very clear to my friends. To me, it's a tedious, laborious pursuit and requires way too much stuff. Obviously, my mind is pretty much closed to ever being a scrapbooker. And, I know for a fact that today was my first and last visit to a convention of scrapbookers. Nothing against these women. I'm sure they're fine people. I just can't do their thing. Alright. Here are some photos to document that I really was - sort of -in attendance at a scrapbooking convention. Look closely - they even had a ... parking lot ... for their rolling scrap-cases! Coming up: scrapbooking wasn't the only big doin's at the Charlotte Convention Center! It's a quiet afternoon and I'm browsing through photos. This one was taken in late May, on Katie's graduation weekend. It was crazy & bustling around here, with people everywhere. The food consumption was over the top. But so was the laughter and love. I miss them. But. We are still family. I love you all! standing l to r: David, Jill, Mark, Katie, Jenny & Dan. Bill & I, seated. Yes, Bill's eyes are wide open because he is guilty of having eyes closed in photos. Well, so am I. Funny! 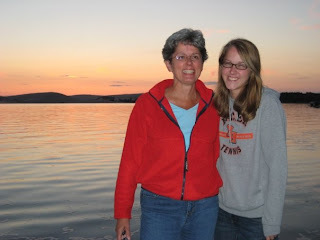 Katie's first question over the phone after we left her at Taylor U. was, "did you cry, mom?" I cried the night before, at the hotel. The next day we helped her settle in her dorm room, home for just 5 days before leaving for Ireland. A temporary and sparse set-up and not feeling really college-like. Then we watched her walk with her new roommate, off to an afternoon class. She never looked back. This reminded me of her ordering me to let her "walk to the bus stop by myself" as a kindergartener. She was ready then for the road ahead, as she is now. So, Katie, on the afternoon I watched you walk into young adulthood, yes, my heart cried. But the tears never came. You're a young woman, and as I said before: go. Discover the world and find out who you are and who God intends you to be. I love you. And I will be just fine. Even if I cry a little. For those of you following this blog, I wrote a post on August 7 but only published it today, August 12. If you want to read "our rings," scroll down to find it. Thanks for reading! Empty nest. Sounds lonely, doesn't it? But when you stop to think about it, would a mother bird ever continue to shelter her young? She has nourished and trained them in preparation for the things birds were meant to do. She wouldn't delay the inevitable, if shaky, flight from the comfortable nest. And anyway, if the fledgling sat in the nest all day, it wouldn't fulfill the purpose and wonder of God's intent. Tomorrow our final fledgling leaves our nest. A little shaky, this flight. But good, and full of wonder. And it's time. For her to fly. Katie, Jill and I took in a matinee of Mamma Mia! yesterday. I'm not sure what I was expecting, but the songs, dances and out-of-character characters burst off that screen. Everyone knows I'm not a huge movie buff, but didn't Pierce Brosnan play the role of Bond? James Bond? So when he sings duets - ABBA duets - with Meryal Streep while dancing across a Greek isle ... it's just tongue-in-cheek hilarious. Check it out. Better yet, go see it, and be prepared to laugh and sing along if you're over 40. What binds us together? A diamond engagement ring? Wedding bands? The marriage vows? 30 years ago, August 10, 1978, Bill and I promised to share our lives. We bought a ring for $8 from a silversmith in the hills of Mexico. The band was about 1/2" wide, so I had the idea to have the silversmith divide the ring into two. At the time, I didn't get the significance. I just liked the ring: its hand-hammered surface exemplified our artsy 1970's tastes. Anyway, as we stood over his workbench, the artisan split the ring, sized my half down, and finished the edges of both rings. If I remember right, he added $4 labor to the price of the ring, so we had a whopping $12 in our wedding bands. I guess after 30 years, we could spring for something more sophisticated. But I don't think anything would carry the uniqueness of our one-band-now-two. The story has elicited many "awwwws" from friends over the years. God brought us together and a promise to love and countless memories keep us together. And so do our rings. We are two. But we're also one. Big changes coming. The last child heads off to college on Sunday. Another son marries next year. Will I get a job? Do I even know how to hold a job? 30 years of marriage. How do we re-organize our nest? 1. Bill and I can talk, argue or watch a movie anytime we want. We can eat popcorn and drink coke for dinner, too, if it suits us. 2. Just when kids become more pleasant to be around, they leave home. This doesn't seem quite fair, but then, I am thankful they are self-supporting and not living here or in jail. 3. There was a time when I made up a seating chart for the van so the kids wouldn't fight over seats. I will not miss those days. 5. Bill's thankful that I'm not bathing kids anymore. In the summer, he'd slam the windows shut so the neighbors wouldn't hear me hollering at the kids to get in the tub. I'd tell him, "be my guest." 6. Now that the kids are gone (until the next college break), maybe I'll make good on my threat to dynamite the basement. You wouldn't believe what's down there. 7. I know I keep coming back to food, but there is huge relief in the fact that feeding us will become much simpler. Why, I might even have time to write a book. 8. I don't know what #8 is, but I think I should end on an even number. Oh, here's one. Come fall, the stress of shoving a high schooler out the door on time for school will be gone. 11 years of that was quite enough. This all sounds good and brave. But come Sunday, I'll probably be a mess. Every so often I get up one morning and absolutely can't stand looking at the counter in the kitchen; the "phone counter." For that matter, the drawer below is equally shocking. I think, maybe if I clear that counter and get it looking neat, the drawer won't matter. The casual passerby won't notice the clutter within. So this morning I led the charge. That is, I led myself to that counter and reluctantly moved on to the drawer. I ask you, how many rubber bands does one family need? How about key rings, paper clips, old pens, broken pencils and Wal-mart receipts? Then I think about my life. Am I more concerned about the messy counters - the areas that others see - than what's underneath? Do I try to look and act good while I neglect what counts? Attitudes. Thoughts. Reliance on self. Not God. The counter is clear now (see photo); the drawer is pretty good. God sees the mess in my "drawer" as clearly as I see the cluttered counter every morning. And only he can tidy it up. As much as I will let him. 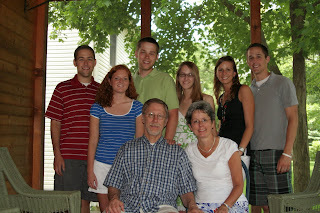 Our youngest, Katie, leaves for college in 8 days. The questions roll in daily now: How can you let go of your youngest? She's going so far! (She's studying in Ireland her first semester.) Won't you be sad? Welp, I've made a decision, people. I've decided NOT to be sad. OK, I'll probably cry as we drive away, realizing (as I did with all 3 sons) that our family is changing forever. Then, I'll wipe my eyes and focus on the absolutely amazing experience that lies before her. Taylor University is one of the best things to happen to our family. Heck, I didn't even know Christian liberal arts colleges EXISTED until David started college-shopping. And we discovered Taylor, tucked away in a tiny town between the cornfields of Indiana. It's not a "religious school." Ooooo, I detest that label. It's an intentional community of Christ-followers and strugglers who desire to discover what God has in mind for their lives. And also to find ways to be his servants. Katie chose to pursue Taylor's Freshman Irish Studies Program and we said go for it. She's a little nervous, but who wouldn't be? This is big! We're mighty proud of her. She will see that the world is vast and begin to discover who she is and who she wants to be. Yay, Katie! Am I sad? A little. But I believe sad is selfish. Sad would be about me and this isn't about me. Go see the world, Katie. Taste and touch and learn and serve and savor all you can. I love you!